One of the key ideas in making a Dark Tower movie was to distinguish it from the books. It wasn’t supposed to be a straight adaptation of the novels, but the next version of the story—a simultaneous sequel/reboot using the mythology of the novels to tell a new version of the story. This sounded like a great idea... until we saw the result. The movie didn’t use the mythology of Stephen King’s epic fantasy series and much as it negated it. From the very first scene to the very last, the movie made huge changes to the books which rendered it impossible to adapt some of the series’ best scenes. A reboot is one thing, but why make The Dark Tower into a movie at all if you’re not going to bring its best moments to life? We don’t have an answer, but we do know the result was a movie that was a major disappointment. Here’s a list of ways The Dark Tower wastes the best aspects of its source material. The first line of author Stephen King’s first Dark Tower novel, The Gunslinger, reads: “The man in black fled across the desert, and the gunslinger followed.” It’s such an iconic line—you instantly have an image in your head of the core of series: good, evil, a chase, and conflict. But the film doesn’t start with that line; instead we hear it spoken later by a disembodied voice during one of Jake’s nightmares. It’s a minor detail, but that almost makes the decision not to use it worse. There couldn’t have been less reason to change it. Instead, the film begins at Devar-Toi, a very important location to the overall mythology of The Dark Tower series. In both the books as well as the movie, this is the place the armies of the Crimson King bring children with strong mental abilities, which they use to try to break the beams that link to the Dark Tower. If the beams are broken the tower will fall, the Gunslinger’s quest will have failed, and darkness will take over the world. In the books, this is very explicitly laid out; in the movie, it isn’t, but that’s a whole other issue. The issue here is this location is so close, figuratively and literally, to the Dark Tower itself that putting it in the film at all removes hundreds of pages of potential storylines. The books probably cover years of travel, and now it’s a journey of a couple of weeks at most. Devar-Toi is one of Roland’s last major stops before the Dark Tower in the books. There’s literally an entire novel (Wolves of the Calla) dedicated to the heroes finding out this place even exists. And then they still don’t visit it until the final book of King’s series because it’s such a struggle to get all the characters back together again and to the location. Finally, once they’re there, the battle results in the death of a major, major character. Having it in this inaugural film destroys almost an unfathomable amount of rising tension and mystery that made the books so good. The fact the movie starts there is just insult to injury. In The Gunslinger novel, Roland lets Jake die to keep his journey to the tower going. It’s one of the series’ most powerful, most harrowing, and important moments. Unsurprisingly, Jake doesn’t die in the movie—in fact, he’s the real star of the story, acting as a conduit for much of Roland’s action instead of the other way around. Imagine if the Game of Thrones TV series decided to let Sean Bean’s Ned Stark live. It’s such a key moment that it’s almost criminal of the movie to omit it. Two books later, King brings Jake back by plucking another version of the character from an alternate dimension, a version that has vague memories of what Roland did to him, setting up a crucial, cautious fear of Roland. With that gone, so is the chance at some truly imaginative storytelling later when the new Jake and old Roland each struggle with dueling memories of their lives before, both with each other and without. In the books, Roland’s first visit to New York is a huge deal. The first several times he does so, he’s at all kinds of disadvantages, the biggest one usually being that he’s not actually himself—he arrives into this foreign world inside the mind of various key characters. He has no idea where he is, what’s happened to him, and has to make sense of our world on his own. I can’t stress enough how important, and incredibly rare, the portals between worlds are in Stephen King’s novels. Every time Roland encounters one, it’s the mark of something major about to happen. They’re well-hidden and very dangerous to find. Entering one is life-changing. But in The Dark Tower movie, portals are seemingly everywhere. The best example is in the Dutch Hill Mansion in New York. Much like in the books, Jake visits the mansion on Keystone Earth and uses a portal inside to get to Mid-World. Unlike in the books, though, this happens very easily and very quickly. He finds the house via a web search, goes there, types in a number and boom, there’s the portal. For a second he does have to battle a creature, like in the books, but he kills it with his mind (?! )—as opposed to the intense struggle several book characters have to endure to draw him to Mid-World. Literally, the entire saga’s second or third major villain is created in this scene in the book. Now, that’s just gone. By stretching the story over seven books, King always makes it feel like Roland’s journey is impossible. Meeting people is a rarity, tens of thousands of miles need to be traversed, and more. But in the movie, using portals in this way takes away that sense of epic scope. And a shorter journey to the Tower is a less interesting one. The Dark Tower film ends with Roland destroying Devar-Toi, which basically means “Boom, problem solved.” The Dark Tower is no longer under siege, and the danger is over. There almost aren’t words for how much that changes the course of the story’s events. In the books, Devar-Toi’s destruction is practically part of the climax—something that happens in the middle of the seventh and final book, after Roland has been on his grueling journey for, well, the first six books. It’s the end of an incredibly long and arduous ordeal, and part of the climax of the entire series. If there is another Dark Tower movie, Roland can literally stroll to the Tower at his leisure. To be fair, despite the fact the movie cribs part of the last book’s final battles, the Crimson King—the Man in Black’s boss and big bad of the series—isn’t seen in the film. He’s not seen until the very end of book seven, which is fine, so at least it means there’s still a potential threat somewhere in the universe of The Dark Tower movie. However, that threat no longer directly coincides with King’s narrative in the books. It would be something totally new. Again, I have to ask: Why try to out-Stephen King Stephen King? The Dark Tower movie ends in a very perfunctory manner. Again, Jake and Roland have destroyed Dever-Toi and possibly the Man in Black, pretty much saving the Dark Tower and the world. With Jake’s parents dead, he decides to stay with Roland in Mid-World and become a Gunslinger. First the obvious: Although this movie was originally supposed to set up an entire franchise, no more story really needs to be told. Sure, it could be, but it doesn’t need to be. When you leave the theater you won’t be dying to see what’s next like you do when you finish each and every book. Meanwhile, The Gunslinger ends with Roland having a long discussion with the Man in Black, which begins to plan out the huge journey Roland will need to go on throughout the course of the series. Book two, The Drawing of the Three, introduces the rest of the main characters, and Roland’s attempts to recruit them to his cause to save the Tower and the world. Without that conversation, and with the Tower safe for the moment, why would Roland need to bring those other characters to his world at all? And even if he does, having Jake there makes it so much easier. The books make it a huge struggle for a sick, tired Roland to complete his task. But at the end of the movie, he’s healthy and he already has a partner to help him out. The Gunslinger’s journey couldn’t look easier. There are certainly other ways the film squandered its source material, but the point is very clear: It feels like the people behind The Dark Tower film did not have any interest in retelling King’s story. 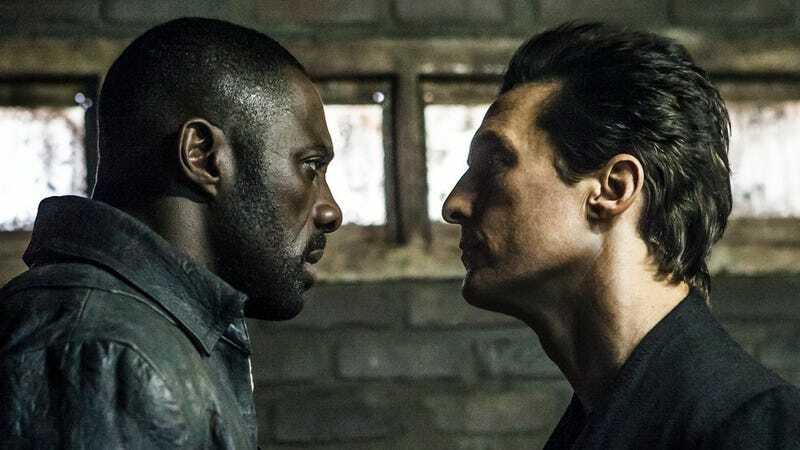 The film only uses small facets of the world to tell a different, much briefer story, when the real strength of The Dark Tower is that it’s an epic. Whether you’re a fan of the books or not, this truncated version can’t help but disappoint. This isn’t all to say future Dark Tower movies are unsalvageable... not that it matters, considering this film’s dire opening weekend box office. But either way, the movie failed to bring Stephen King’s masterful storytelling to the screen, which is what fans have loved about this series since The Gunslinger was first published in 1982. And it was a change that benefitted no one and nothing.